Cut off the hard underneath part of the asparagus and peel. Cut cheese into pieces. Cut ham into thin strips. Heat up stock, add cheese, stir well and allow to melt. Add beer and cook. Steam the peeled asparagus in a steamer until they are cooked but not too soft. Place the asparagus on pre-heated plates with the hot sauce and sprinkle with nutmeg. Garnish with strips of ham, finely chopped chives or leaf parsley. 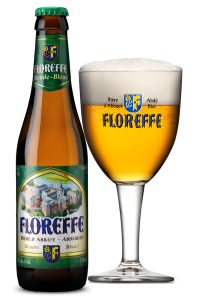 Serve with toast or strips of ciabatta, accompanied by a good cool glass of Floreffe Blond.